La fine dell’anno e’ tempo di bilanci… cosi’ eccoci a valutare come e’ andata la sfida tra auto e bici in casa sacchibelli. Abbiamo cominciato a conteggiare i km percorsi dall’elemento maschile di casa sacchibelli a partire dalla week 27 e al tempo stesso abbiamo annotato i km percorsi con l’auto. Alla fine ha vinto l’auto, ma lo scarto e’ piccolo e in prospettiva (considerando l’eccezionalita’ di questo periodo, con il preannunciato arrivo di cicogne) i sacchibelli non escludono di riuscire a dimostrare che e’ possibile vivere senza essere completamente schiavi dell’auto, anche in paesi, come l’Italia, dove la cultura della bicicletta e’ decisamente poco sviluppata. Ecco comunque il grafico riassuntivo di questa appassionante sfida. Alla fine l’auto ha vinto per 2206 km contro i 1738 percorsi in bici. Considerando che la nostra auto percorre circa 15 km con un litro, nella seconda meta’ del 2009 abbiamo consumato circa 147 litri di benzina. Di sicuro non abbiamo arricchito i petrolieri locali e, forse, Al Gore puo’ essere fiero di noi. 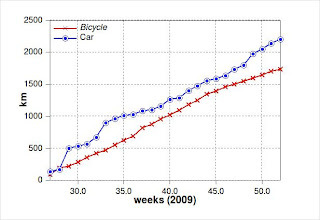 In the last six months of 2009 we try to evaluate how much we were using bicycles compared to car. The experiment was done on the male component of the sacchibelli family (the female one, being pregnant, cannot ride in this period) and at the end, although the car is winning (2206 km vs 1738 km by bike), we think that to live without being slave of cars is possible. And maybe, next year, we will be able to ride our bicycles more than drive our car. Succede che durante le vacanze di Natale molti degli amici che abbiamo in giro per il mondo tornino da queste parti (evidentemente affascinati dal freddo e dalla neve…). Qualche giorno fa era passata da casa nostra la mitica Dany, da San Diego, mentre ieri sera abbiamo avuto il piacere di rivedere l’altrettanto mitica Fede (in arrivo dalla Germania, ma transitando per San Francisco…); e l’occasione e’ stata davvero speciale perche’ ha permesso di radunare intorno a un bel tavolino (ricco di dolci, tisane e quant’altro) tanti cari amici. E cosi’ non abbiamo resistito alla tentazione di postare la foto sul blog :-). Cosi’ ecco una foto di gruppo con (da sinistra a destra): Fede, Silvia, Alice. Agnese, il sottoscritto (master in autoscatto), Achille e Luisa. Che dire, proprio una bella serata. Grazie di cuore a Fede e a tutta la truppa. During Christmas holydays it happens that many friends living around the world come back (probably because they love cold weather and snow too…). So, few day ago we met Dany, who lives at San Diego, while yesterday we had the opportunity to see again Fede, who usually lives in Germany. She invited us, together with a bunch of dear friends, at her home, and we really spent a great evening. Thanks to everyone!!!!! And let’s post a nice picture to remember this moment. 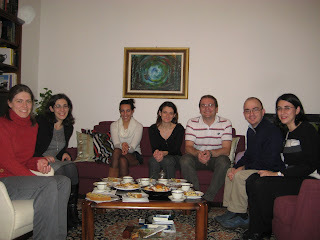 Here you can see, from left to right, Fede, Silvia, Alice, Agnese, myself, Achille and Luisa. We already mentioned Silvia’s “knitting” activity. 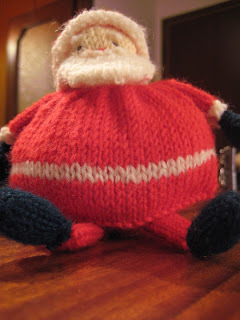 She is really surprising us, and today we are proud to show you one of her last creations, Santa Claus. Our friend Dany sent us, as a lovely gift, this book, and Santa Claus scheme comes exactly from there. 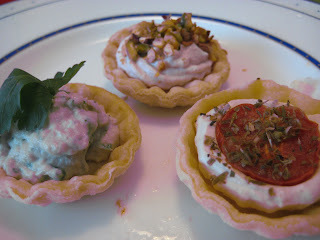 And trust me, you will see more and more creations made by Silvia in this last period of her pregnancy…. Ormai Natale si avvicina e anche noi inviamo ai nostri cari lettori i piu’ sentiti auguri di buone feste. 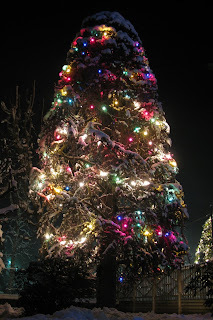 Mentre l’anno scorso avevamo postato l’originalissimo albero di Natale dei pompieri, quest’anno siamo piu’ tradizionalisti e siamo lieti di pubblicare in esclusiva una foto del bellissimo albero di Natale realizzato dal nostro amico Antonio (colui che non ama ne’ la cannella, ne’ il cilantro). Complimenti Antonio, l’albero e’ davvero stupendo!!! Christmas time is very close, and sacchibelli wish Happy holidays to our readers. Last year we posted the fire fighters Christmas tree, while this year we are pleased to post the amazing Christmas tree made by our friend Antonio (the one who doesn’t love cinnamom and cilantro). Pochi mesi fa abbiamo postato qui una foto relativa a un brillante parcheggio che ho fatto in uno spazio di poco superiore alla lunghezza della nostra auto. L’altra sera ho ripetuto l’impresa; certo, stavolta c’era qualche centimetro in piu’ di spazio, ma a complicare l’operazione c’era anche la neve e la strada ghiacciata…. Some months ago we posted herean impressive picture about my art in the “car parking”. Few days ago, although I probably had few centimetre more, I repeated something similar, and probably harder too, considering that it was snowing and there was ice everywehere… Look at the picture, please. And call me if you have to park in a small room…. The big chill is a famous movie, but we are not referring to it, but to the cold weather that we are experiencing here in the north of Italy during this days. Maybe it is mainly suggestion, but we feel a very cold sensation, and it happens that temperature stays below zero (Celsius, don’t worry too much) al day long. Now it is snowing too, so you feel cold only watching outside from the window…. So, let’s keep some picture to transmit to you too the cold sensation we are experiencing…. 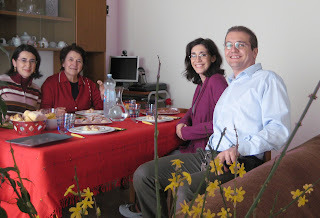 Yesterday we had a lunch with our friend Dany, here at our place. She lives at San Diego, where weather is significantly better than here, and where winter is replaced by a warm spring… So, although outside it was very cold, it was a pleasure to share with Dany a nice moment, to talk about what happened during last year, to talk about the future, about ou rprojects and our concerns. We hope to see her as soon as possible, and although we are living so far each other, we feel Dany very clos eto us. Thanks Dany for visiting us during this Christmas period. Oggi, sistemando vecchi backup, mi sono imbattuto in un file scritto 5 anni fa su richiesta del mio medico che sosteneva (forse a ragione) che fossi sovrappeso. Per convincermi di cio’ mi chiese semplicemente di prendere nota di tutto cio’ che mangiavo nel corso della giornata, per due settimane. Cosi’ facendo avrei potuto rendermi conto che una dieta sarebbe stata opportuna. Ovviamente feci la lista ma non mi convinsi della necessita’ di mettermi a dieta. Era l’ottobre 2004. 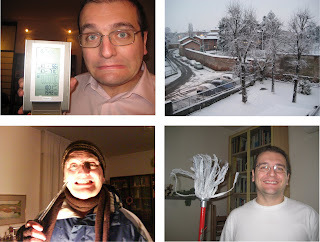 Tempo un anno, “cambiai” idea (l’8 ottobre 2005 ho infatti sposato Silvia…).